Take 1/4 cup warm water in a cup and dissolve sugar and yeast. Let stand for 5 minutes. Turn out onto a floured surface; knead dough until smooth and elastic (about 5 minutes). Now move this into a warm area for 45 minutes to rise. The best place is usually the oven with the oven lights on. After the dough has risen, uncover the dough and punch it down (take out the air), cover, and let it rise for another 30 minutes. For the last time, take out the dough again and punch it down. Let it rest for 10 minutes. Now take the dough out onto a floured surface and roll into a rectangle the size of the loaf pan. Move into the pan taking any large bubbles out. Let it rise for the final time for 30 minutes. While dough does its final rise, preheat oven to 425° F.
Bake for 12 minutes. Reduce oven temperature to 350° F; bake an additional 15 minutes or until loaf sounds hollow when tapped. 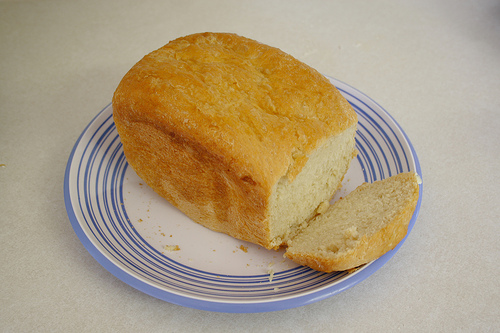 Slice the bread using serrated knife and serve with either butter or olive oil. Long time Rahiv je. I am a good eater then a cook so I will pass it to my wife who loves anything to do with doughs. Thank you. Hi Rajiv u r so right the fragrance of fresh baked bread is magical that it just makes ur stomach, brain and mouth cells function. I love fresh bread with butter. Thanks 4 sharing after such a long time.